This module provides an expansion power supply. Under normal operation, the TSIO-1001 SynqNet® Network Adapter or the TSIO-1002 CANopen Network Adapter supplies a basic field power supply of 10A. 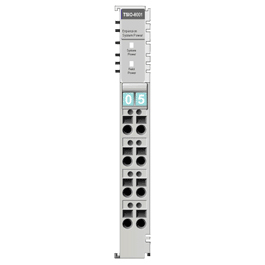 If your I/O setup requires current greater than 10A, this expansion power module ensures sufficient current for all slices. It receives external 24V input, converts up to 5V/1A, and supplies new system power to attached slices.